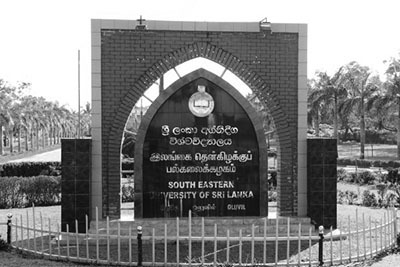 South Eastern University College of Sri Lanka was established for the displaced students and academic staff from Eastern University on 26 July, 1995. By October 1995, basic facilities were found and staff appointed to commence academic activities in part of the premises of the Government Teachers' Training College at Addalaichenai. on 27th March 1996, South Eastern University College was upgraded to a National University under the corporate name of South Eastern University of Sri Lanka. In May 1998, the University was shifted from Addalaichenai to Oluvil. South Eastern University of Sri Lanka (SEUSL) is now located in its beautiful and picturesque location at Oluvil spanning in around 200 acres of land bordered by the Indian Ocean to the East, A4 highway to the West, Gal Oya to the North and Oluvil Village to the South. SEUSL is one of the comprehensive residential universities in Sri Lanka which has at present provided hostel facilities to its 82% of student population. This university consists of six different Faculties namely Arts and Culture, Management and Commerce, Applied Sciences, Islamic Studies and Arabic Language, Engineering and technology. In addition SEUSL offers a total of 58 degree programmes, four postgraduate programmes and three external degree programmes. 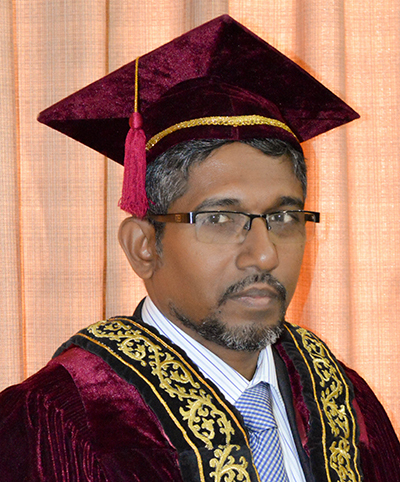 SEUSL confers over 1200 Bachelor’s Degrees and around 20 postgraduate degrees on students/graduates annually. The student population of SEUSL has gradually increased and at present the total population of internal undergraduates are 4800 coming from all over the country, from various socio-cultural and ethnic backgrounds. Hence SEUSL is an ideal locality to foster social harmony and coexistence. SEUSL with its mission “to Provide Expanded Opportunities for Higher Learning of International Standards through Generation and Dissemination of Knowledge and Innovations Focused on Regional and National Needs, Social Harmony and Stakeholders' Empowerment and Satisfaction” is dedicated to generate and disseminate knowledge. SEUSL, hence, produces competent and capable workforce necessary for the country and to satisfy the global needs. SEUSL, as a budding national University is gradually developing and is in the process of bringing in necessary improvements to face the challenge of catering to the rapidly changing national and international requirements. SEUSL has taken all the efforts not only to provide educational components but also to facilitate students in enhancing their skills by providing best facilities. I would like to invite prospective students to enroll with us and enjoy the best facilities we have under a conducive learning environment. The students who enroll with us will be enjoying the natural beauty, rich biodiversity, water fronts and clean environment, while striving to become demanding graduates with academic excellence.